You are here: Home › Prisoners › ALERT! Guards harassing LBTQ2+ Prisoners at GVI Women’s Prison! ALERT! Guards harassing LBTQ2+ Prisoners at GVI Women’s Prison! 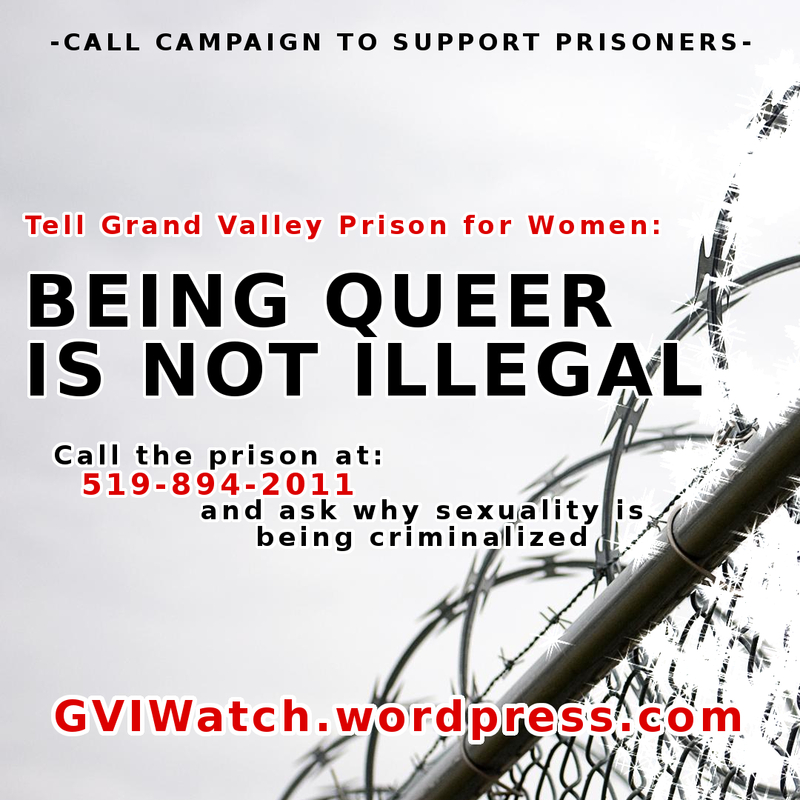 At Grand Valley Institute for Women (GVI), a federal prison in Kitchener, Ontario (in Canada) there has been a recent crackdown against LBTQ2+ prisoners and/or prisoners in relationships amongst themselves. Intimate relationships between prisoners are being attacked by a clique of guards acting without apparent direction or oversight from the Corrections Canada administration. We need your support with a call-in campaign to end these practises. Harassment of prisoners includes throwing them in solitary as punishment for being in a relationship, threatening them with transfers to remote parts of the country, separating partners by placing them in different parts of the prison, and laying spurious institutional charges that can lead to being locked in the maximum security unit. Most troublingly, guards have been using physical intimidation and invasions of personal space to harass prisoners who speak up against these practices. In violation of their own rules individual guards have been entering prisoners’ cells at night; with an institutional history of sexual violence and exploitation of prisoners by guards at GVI, this can only be understood as a threat. All of this is happening due to a growing culture of impunity among the guards, created by a power vacuum at higher levels. GVI currently has no warden overseeing the actions of the guards and doesn’t expect to hire one for another year. The Federal Corrections Investigator whom handles oversight and prisoner grievances, didn’t have his contract renewed by the federal government, leaving no one to respond to grievance reports filed by prisoners. Compounding all this, the recent elections have left the government without a sitting Minister of Public Safety and the prisoners are left without the flimsy accountability that may offer. GVI still has not made any of the necessary changes with respect to the Ashley Smith inquiry, which drew national attention as the prison was investigated by a coroner’s inquest into a prisoners death in segregation. The prisoners have been organizing in response to these attacks, but have faced increasing repression for their efforts. Their attempts to start an official two-spirited group were turned down, and there has been little ability to meet or congregate without official consent (by contrast, an application for an association of white prisoners, made by white supremacist inmates, was approved immediately). Outside support right now can make a major difference in putting a check on the repression of prisoner relationships and dissent among prisoners. Why are you criminalizing inmates’ sexuality? Why are you denying people in segregation access to their lawyer? Why is there currently no meaningful way for inmates to file grievances about abuses of power by guards? Hello, can I please speak with the acting warden? My name is (Insert Name Here) and I am calling to address the alarming conditions inmates are experiencing in Grand Valley Institute for Women. Word has gotten out that through the practises of your guards, prisoners rights are being trampled upon and prisoners sexuality has been criminalized. This needs to end now. There is no policy within the Commissioners Directive that gives guards the authority to deny consensual physical intimacy or expression of sexuality among prisoners. Harassment and punishment of prisoners for their sexual preferences and dissent against this treatment needs to stop immediately. I demand that you stop denying prisoners in segregation their right to see their lawyers. Approve the application of the prisoners two-spirited group to meet. Address the issue with your superiors of providing a meaningful ways for prisoners to file grievances against abuses of power by guards to a functioning, independent organization. Get your guards under control and stop the continued punishment of prisoners for their sexuality and dissent. Now that these situations have been brought to my attention, I will continue to follow the situation to ensure these issues are resolved. THANK YOU FOR MAKING THIS CALL! Now get all your friends to call, too! Visit the website: GVIWatch.wordpress.com, to share with others about what making the call was like for you and for further updates.